Community visit to the Ixtaca project. Photo by Minera Gorrión. Canada’s Almaden Minerals (TSE: AMM) deemed as false the allegations in a letter written by a group of activists from the Ixtacamaxtitlán municipality and presented to the Mexican president, Andrés Manuel López Obrador, during a visit to the town of Huauchinango. 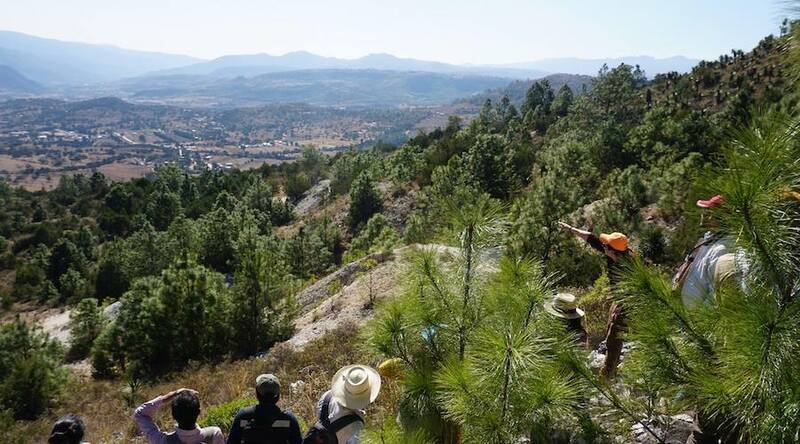 According to the company’s CEO, Morgan Poliquin, the people that presented the letter blasting the Ixtaca project, located in the Puebla state, are anti-mining activists that do not represent the local community and that base their allegations on an inaccurate Human Rights Impact Assessment report that was financed by foreign NGOs. “That report says that we didn’t talk to the community, that we have been fined, that we have polluted the water, that we have used explosives. This is not true and after it was published in 2015, government inspectors visited the site and found nothing wrong,” Poliquin told MINING.com. Poliquin said this is the reason why, as the activists denounce in their letter, their human rights assessment has been ignored by the institutions it was presented to, including the Secretariat of Environment and National Resources, the Federal Procuracy of Environment, the National Water Commission, the Secretariat of Economy, and the National Commission of Human Rights. In spite of this, in the missive to López Obrador, the activists ask the president to cancel the Ixtaca project. They say they have not been properly consulted and that the project would affect their lives and cause severe environmental damages, particularly to the Apulco river which is a source of fresh water for domestic, recreational and agricultural uses. However, Poliquin said the activists do not even live in the area of influence of the mine. The executive also said that his company has taken all the required steps to make sure the 2,000 people on the impact area are consulted and informed about the project. “We have a very transparent engagement process. We have monthly meetings where we bring outside experts in mining law and human rights, in explosives, in cyanide to inform the community because this is new to them as there is no modern metal mining in Puebla. It has been a joy on my part to make sure they have the resources at hand to make their own evaluation,” Poliquin said. The CEO cited the independent Social Impact Assessment that the company commissioned to GMI Consulting, despite the fact that this is not a requirement in Mexican law. Such evaluation found that the Vancouver-based firm had consulted widely with the focus area communities, that the Ixtaca project was well understood, and that the people had had the opportunity to express their views on the impacts of the mine. “I think we are the only ones who have done this and just before Christmas, the new administration said this could become a requirement from now on,” Poliquin said. Regarding the environmental concerns that the activists expressed in their letter, Poliquin emphasized that the company has just submitted an Environmental Impact Assessment to the Secretariat of Environment and National Resources where they address these issues. Almaden’s leader pointed out that the project now doesn’t include a separate tailings pond but a dry tailings facility that reduces the environmental impacts. He also said that isotanks will be used in a closed circuit for the leaching process, which prevents contact with the surroundings. In terms of the complaint regarding water usage, the mining exec said that in their EIA they have established that there will be no extraction of underground water or discharges of wastewater. They have also planned to build a dam system with a capacity of 1.8 million m3 of rainwater, which would supply both the mine and nearby communities. Following the approval of the EIA, Almaden will focus on taking its multimillion ounce, 1044-hectare mine into production. Ixtaca reserves have been estimated at 73 million tonnes of ore average 0.59 g/t Au and 36.3.9 g/t Ag.